Slategrey to blue with yellow to beige stripes on belly and tail, spots on the legs. The head is elongate and flatter than the rock monitor's. 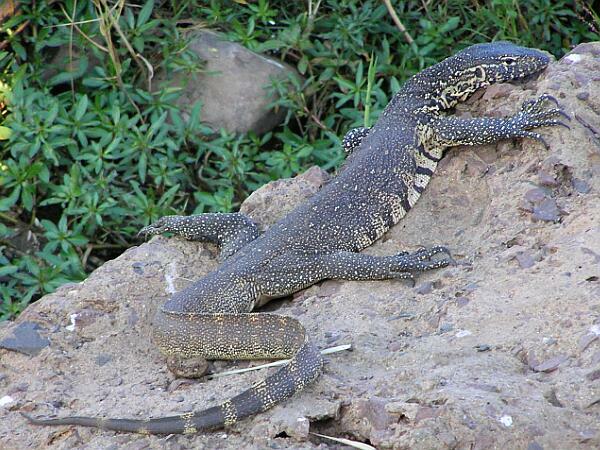 Common near large waters, the Nile Monitor is a protected species in Southern Africa. Found in wet regions close to permanent rivers and lakes throughout Africa. An fully grown Nile Monitor warming on a rock. The slimmer body and longer tail, the elongate head and the bluish colour make it distingishable from its land relative, the Rock Monitor. A juvenile Nile Monitor basking in the sun. The colours on body and tail are still strong in contrast.